When I was a kid, my mom stuck rusty metal rods in the ground to help her tomato plants reach for the heavens. Here on the farm we a have a slightly more high-tech version, but one that could be adapted for the home gardener without too much effort. 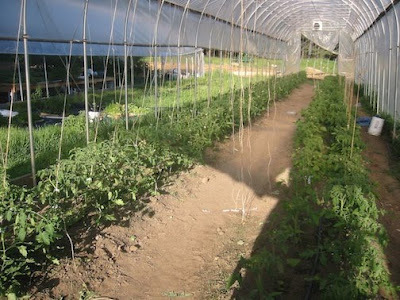 Lines are run across the top of our greenhouse in four rows corresponding to the four rows of tomato plants. 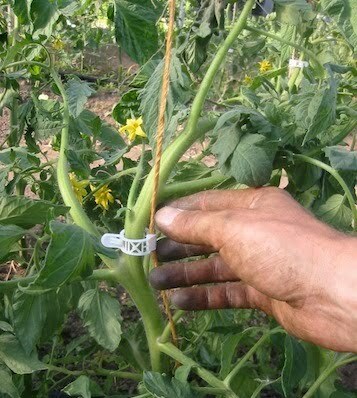 Then we attach long metal hooks to the lines, tie twine to the hooks, and then fix them to the plants with little plastic hooks. Adaptations for the home garden could be a simple as tying a rope to the side of the house and twisting hangers for the hooks, though if you wanna get all fancy, the necessary components are available at any garden store or online. We had a huge storm here last week that knocked over a bunch of our tomato plants, so the expected reinforcement operation was expedited into a sort of tomato first-aid emergency. Twisting the fallen plants upright required a little gentleness to avoid damage to the stem, and it's best to hook the lines under a strong branch, preferably one that is not going to bear fruit. When it was done, my hands were coated in resin but the plants all stood up straight like good little tomato soldiers. One problem with gardening in the city is the likelihood of your soil being somewhat toxic. There are simple tests for this that you can buy online, as well as services that you send a sample away to in order to see what's going on. Here's a great article with a few tips on what to do if (or in Brooklyn, when) your garden has a bit too much bad stuff. Before I planted my garden, I spoke to a botanist friend who had some of the same recommendations as in the article - plant fruit stuff in the toxic soil, and leafy stuff in raised beds - so that's what I did! I just got back to the US, after being away for a year, and I'm so excited to get back to my garden! After a quick trip to a garden center (compost, soil, turning fork, rake, flowers), I dove right in. The 2 small plots we have in our backyard make up about 80 square feet or so. There's a 4X8 above-ground space, a 6X7 in-ground space, and one more small 1X6 in-ground space. Since I've started growing, I've mixed in lots of good soil and compost to try and fix up the "natural," and somewhat toxic, Brooklyn soil. This year, because we were away, the area had grown over pretty well. The first step was to pull out the larger stuff and turn over the whole plot with my new fork. Fun! After doing that, and seeing some nice brown soil, I mixed in a few big bags of compost and clean soil to rehab the ground a little bit. I was given a couple tomato plants and a pepper plant by a friend, so I put those in the ground to get started before I hit up the local farmer's market this coming week to pick up all the rest of my potential crop. It'll be tomatoes on the right, and peppers and greens on the left. This year I'm planning on lots and lots of tomatoes, some bell peppers, and as much leafy greens that I can fit in the space I have left. For a long time, I've had lots of houseplants around, but in the last few years I've been lucky enough to live somewhere with a backyard. My landlord was nice enough to let us take over part of it, and we've been growing ever since - delicious heirloom tomatoes, all kinds of peppers, salad greens, herbs, radishes, peas, beans and so on.